Traditional market research processes are failing to meet the demands of organizations due to long process timeframes, scalability and scarce resources. Methodify, with its automated capabilities and affordability, purports to solve these challenges, enabling customers to conduct market research faster and at a lower cost. “The number-one thing that gets everybody excited about this is that we’ve taken a four- to six-week process down to 24 hours,” says Steve. 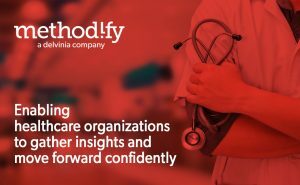 To take a closer look at how Methodify has helped two Canadian healthcare organizations accelerate their research process and turnaround time, visit eHealthcare Strategy and Trends.